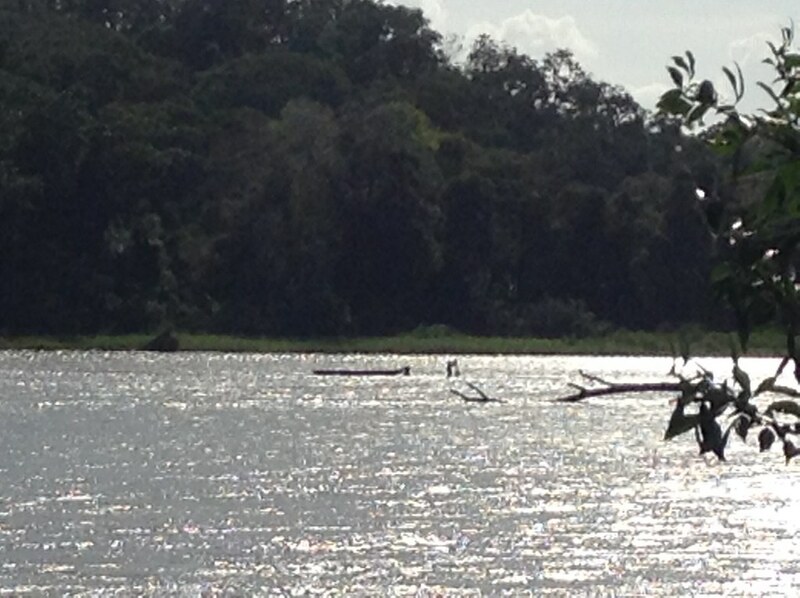 The road to San Carlos and beyond on the Río San Juan is an arduous trip involving multiple modes of transportation. There is a more direct route, thought it is not for the faint of heart and it is the one we chose. The ferry from Altagracia at the base of the Concepcion Volcano on the island of Ometepe, leaves under the cover of darkness twice a week. In the morning when you wake up – assuming you were able to sleep – you can see the sun rise over the mouth of the Río San Juan in San Carlos. 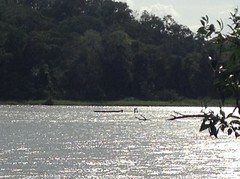 We wanted to make the trip to the river and travel east toward the Caribbean coast to see the unspoiled river and to share in her natural beauty now, before a proposed canal, financed by the Chinese government, rends the Central American isthmus again here at the border between Nicaragua and Costa Rica. The river is wild still. Rainforest reaches its gnarled fingers into the rushing water where human activity is minimal. Dugout canoes, long motorized boats teeming with locals who live in the scattered communities along the banks and tourists who want to share in the beauty, and the occasional fishing vessel are the only traffic here. Otters and fallen branches are the hazards on this highway. Before you can get to the San Juan River, however, you have to get to San Carlos. The crowd begins gathering at the end of the dirt road outside Altagracia about an hour before the sun goes down on Thursday night when the ferry leaves at nine. By the ticket office, where a first class ticket (foreign travelers must by the ticket for the upper deck) are about $8 each. As with anything associated with travel to this river – from the time of the launch to the length of the trip, the price is subject to change. The first class ticket does not bring with it luxury accommodations. Twelve rows and two columns of long benches facing a 27 inch television in an air conditioned box is what you get. For the brave, and those with an additional $3, there are lounge chairs for rent on the aft deck. Until the boat roars through the darkness and hammers against the dock beyond the gate, travelers busy themselves with conversation, preparing and eating dinner (or you can purchase prepackaged snacks or a freshly fried chicken and rice tortilla from the one tienda there for $1). The Toña flows freely from quart bottles shared by friends and friends you are meeting for the first time. Flor de Caña, Nicaragua’s smooth rum, is lifted in plastic cups and tipped back straight from the bottle. Everyone has a story. 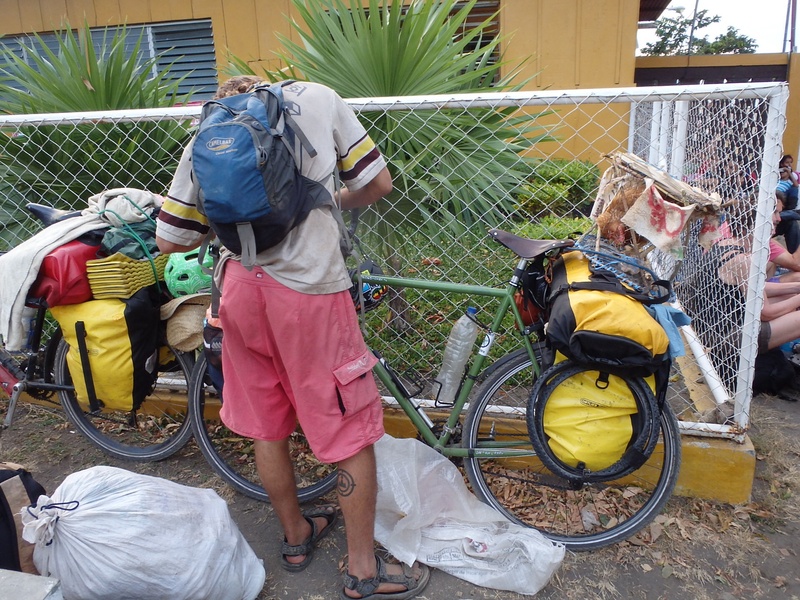 Jesus, who has lived on the island his whole life, but work is hard to come by so he’s headed to the river to try to walk to Costa Rica in search of a job. He has no passport so he plans to sneak across the border. Ike and Henry started their bicycle journey in California and plan to be in Brasil in time for this summer’s World Cup. A 27-year-old Canadian man and his mother are traveling because it’s how they learn about the world and about themselves. Raul has a river job in San Carlos. 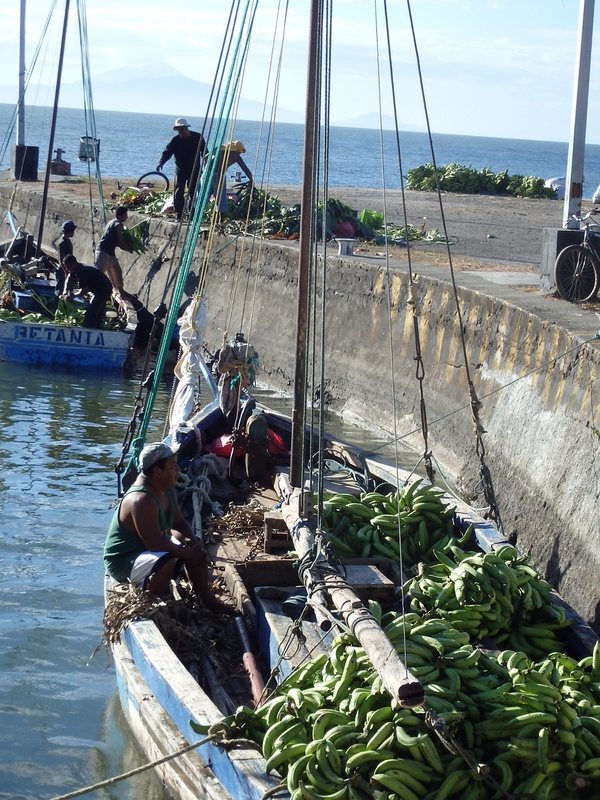 On the other side of the gate, lorded over by a security guard with a menacing shot gun and a soft heart, plantains are being loaded into ancient wooden sailboats before the sun goes down. Trucks and ox-drawn carts bring the fruit to the waterfront where they are stuffed into the boats by young men who wear their shirts tired around their heads. 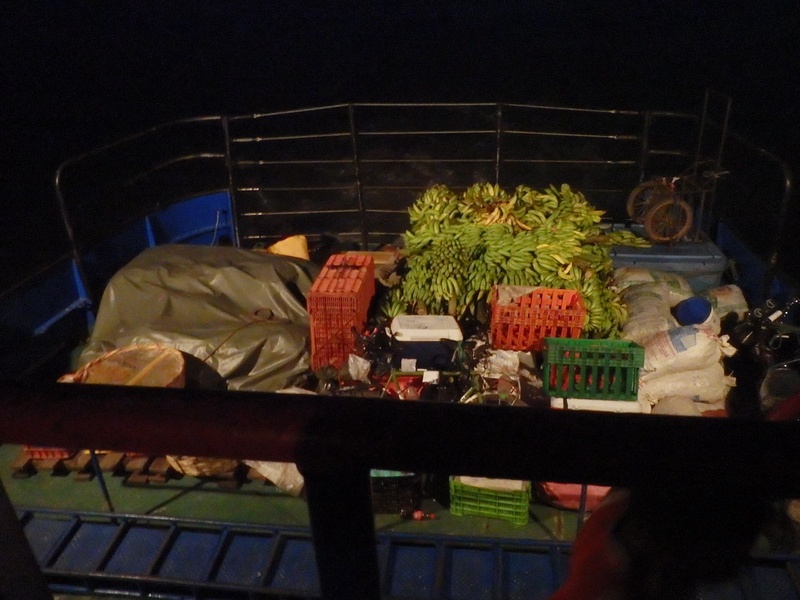 Once the boats are full and lying low in the water, the plantains are covered with leaves and the deck is put over them. Merchants with goods headed for the river and individuals with large loads are passed through the gates to leave their items to be loaded on the ferry when it arrives. They leave their things and join the rest of the crowd outside the gate. No announcement is made about the ferry’s arrival or the manner in which we are to get aboard. Suddenly, silently and then with an escalated grumbling, we queue up. The gate opens and we spill, undirected, toward the boat and across the blue gangplank. Those with the blue first class tickets scale the steep stairs to the upper deck, white ticket holders crowd into the lower quarters. The steel ship bangs, creaks and shudders against the stone dock. The trip ahead will take 8 hours. Or 12. Or 11. Or 15, depending on who you ask and when you pose the question. We smash away from the dock a little after 9 p.m. Five to seven foot waves thunder over the lower deck and shower over the rail on the port side up top. A small group grips the rail to watch the orange moon slide from behind the whitecaps into the velvet sky. Quickly, the exhaustion of travel and waiting and loading becomes too real and everyone claims a spot to sleep. Some slither onto the lounge chairs under light waterproof jackets or without. Some sit inside against their backpacks, arms crossed, heads bobbing. Some stretch on the benches or under them on their sleeping mats. I found a quiet corner of the room, too small for most, and spread out a jacket. A purse for my pillow and a sarrong for a blanket, I curled up and listened to the waves crashing against the boat. A little after 5, Steve gently woke me and told me we were not far from our destination. On deck, we could see the sun beginning to tinge the corners of the sky a pinkish orange. The water was calm as we trickled from Lake Nicaragua to the Port of San Carlos at the mouth of the river. The small town outside the terminal was blinking open in the dawn light. The boat slid silently to rest and we disembarked, still rubbling the sleep from our eyes. “Cafe. Cafe con leche,” the vendor called, her pink ruffled apron still clean this early in the morning. We purchased a ticket for the trip further down river. Two hours before that trip. After San Juan de Nicaragua, are you going to Los Cilos,CR ? Sorry it took so long to reply… We are back in the states and cruising around Florida on a sailboat. If you get up here, let us know! Hope to go back to CA soon, but this year we are thinking of Cuba!